London, UK -- We're face to face. 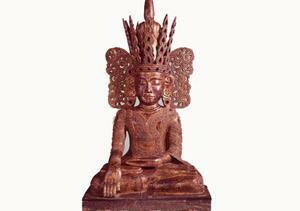 He's a Buddha, a Burmese Buddha, made from gilded teak in the 18th century. He's like a magnificent frog. He wears an enormous royal headdress, he's sitting cross-legged, and his eyes, like most Buddha's, are half closed. His right hand touches the ground in a gesture known as the bhumisparsha mudra, the "earth witness" mudra. He's calling the earth to witness his worthiness to attain enlightenment. And me? As I stand in front of him, in the V&A's new galleries devoted to Buddhist sculpture, how do I fit in? Some people have a second language. Some people have a second religion. They grow up in one, but in such proximity to another that, even though they don't practise and believe it, they're intimately familiar with it. It's not their faith, but they know its forms and its feelings. This isn't my case at all. I was raised in a moderate rural C of E Christianity, and didn't make a proper acquaintance with any other living religion for a long time. The nearest thing I had to a second religion was probably the religion of ancient Greece and Rome. I knew about its gods and myths, and a little about how it was practised. As a child, I invested quite a lot of imaginary emotion in it. Of course, this was play. There weren't any real Mars and Venus worshippers in the village to join in with (how amazing if there had been.) Collectively-emotionally speaking, the classical religion had been defunct for ages. Nowadays, I have a vague idea of what it is to be a Roman Catholic, and a Jew, and a new age pagan. None of it goes deep. But people who are into art should be able to do all sorts of religion, and quite deeply. After all, the majority of the world's art objects are strongly attached to some religion, dead or alive. Yet, with our limited individual experience, most of us have little sense of what it would be to belong to more than one or two. Some of you reading this will be Buddhists, cradle or convert, of this or that sect. Some of you will be non-Buddhists, who've still picked the faith up pretty fluently. Some of you will be like me – looked at a few statues, done a bit of reading. And some will know even less. We can all go to the V&A, and look at this marvellous display. It begins with an absence. The earliest Buddhist art avoided depicting the Buddha directly, preferring a symbolic substitution. Veneration of the Empty Throne is a delicate little carving that shows two followers looking with reverence at his vacated seat. It comes from the second-century AD, that is, about five centuries after the Buddha's departure into nirvana, and that may possibly be what the throne's emptiness signifies. When depictions of the Enlightened One himself arrive, they bring their own surprise. Buddhism seems remote from Western forms of spirituality. But these figures often show, mixed in with Indian traditions, the influence of Graeco-Roman sculpture. It had come over with Alexander the Great. You'd think that the tense muscularity, which characterises the classical body, would be alien to a practice of meditation that aspires to disembodiment. But apparently not, which indicates, I suppose, that style and meaning don't always mesh. That's one version, and the Buddha already has his constant distinguishing marks. There's the tightly curly hair, the "wisdom bump" on the top of the head, the third eye in the middle of the brow, and the long droopy ear lobes where once hung the heavy earrings that the Prince has now renounced. But the lesson of these galleries is how much the Buddha's image has varied, as Buddhism itself evolved and spread, from Afghanistan to Japan. Skinny, sleek, alert, half-asleep, monastic or regal, he goes through his paces, whether seated, standing, lying or sometimes even walking (though no examples here). The largest statues in the world are Buddhas. This show has the face chipped off from a pretty big one in China. The religion of transience and renunciation is embodied in the grandest and most glorious effigies. True, you might say the same of Christianity. And if you come from a Christian background, as many of the V&A's visitors will be, it's hard to avoid making cross-references. How do images of the Buddha compare with those of Jesus? There are big differences. A Buddha is imbued with divine power and can be worshipped. But a Jesus, well, it's telling that the phrase itself sounds odd. An image of Jesus is not a Jesus. It is not to be worshipped, at risk of idolatry. It is only a focus for Christian worship. That's the theory, anyway. Another difference seems to be in how a figure relates to its viewer. Jesus generally gives us eye contact and soul contact. He invites our pity or offers us his compassion. The Buddha doesn't. He presents himself to us in an inward, self-contained state. You look at him. He doesn't look back. His gesture may be addressed to the worshipper. His eyes, as I said, are almost always half-closed. Yet there must be more to it than that. Even if you approach a Buddha purely as a sculpture, one of its most salient points is that it's so frontal. There are no twists and turns in the body. It may have been modelled fully in three dimensions, but it's designed to be looked at from one angle, face to face, and if you're using a Buddha probably, rather than observing it like a connoisseur, that's how you address it. There is also its firm stillness. This is especially powerful when a meditating Buddha is holding its breath. The statue appears to become strangely animated. The literal and inherent stasis of its stone, metal or wood seems to motivated by the way figure is deliberately but temporarily refraining from movement. It is dramatically on hold. And the viewer, standing front to front, finds it hard not to enter into this state too. Jesus' trick is passionate eye contact. The Buddha draws us to him with bodily empathy. Or at any rate, through my own responses, that's how I imagine a Buddha would be used when it was being used in a proper Buddhist way. But without the right background, I can't be sure that I'm right, and certainly it isn't right in every case. Some Buddhas are clearly just trying to impress us with their elaborate opulence – one of the star exhibits here is a Burmese shrine, a super glittery bit of craftsmanship. Sometimes, the interest is narrative. Besides, I'm probably making a mistake typical of art-minded people. We tend to assume that art is the most important thing in the world, and that therefore it must also be the most important element of any religion that it's connected to. We go into a gallery dedicated to religious art and treat it as if it were the key to that faith. Of course, it's not. It's just that the gallery, for obvious reasons, has left out the temples, personnel, rituals, prayers, stories, doctrines, good works and all the other stuff that makes up a religion. And the high masterpieces of religious art, the kind of works you see on display here, are likely to be the least important things on those terms. Any tourist who's been into a working Catholic church in search of the Michelangelo or the Caravaggio will have noticed how the faithful come in and pay reverence elsewhere, lighting their candles in front of some appalling bit of sentimental kitsch. Meanwhile, we gaze in awe at our masterpiece. Well, we all have our religions.